It was my privilege to be asked to pay tribute to the noble Sheikh Nimr at the Islamic Centre in Banksia (Sydney) on January 9th, 2016, following his brutal (and largely unanticipated) beheading by the Saudis. 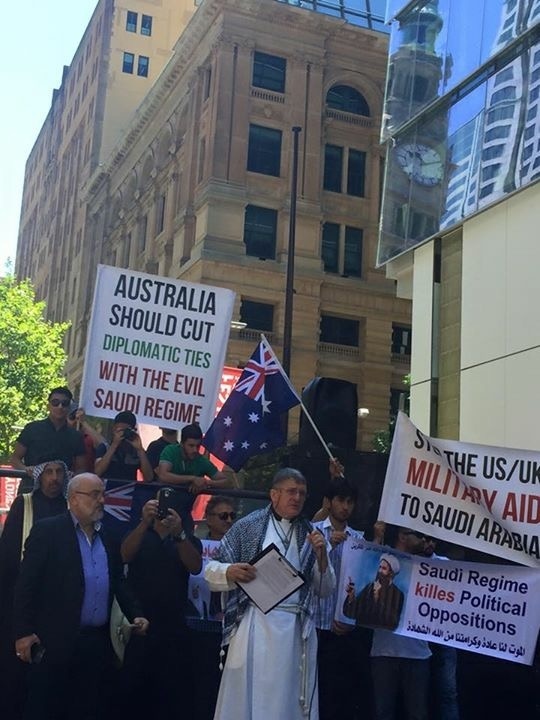 I was then asked to repeat my speech at a rally in Martin Place (in the centre of Sydney) the following day. The full transcript of my original speech is pasted below the video excerpt. We gather to mourn the martyrdom of Sheikh Nimr Baqir al-Nimr (peace be upon him) – a man of principle, a man of courage, a man of God! Perhaps the violent martyrdom of this man should not surprise us. Perhaps no act of violence from the house of Saud should surprise us – a regime already drenched in the blood of the people of Yemen, of Bahrain, of Syria and Iraq (through its proxy armies), and of the blood of so many of the Shia community within its own borders. Even so, it is hard to know exactly why the Sauds chose this moment to murder this good man. Was it simply an attempt to stir up more trouble for Iran, are they hoping to profit by exploiting sectarian divisions between Sunni and Shia across the Muslim world, or were they simply satisfying their own blood lust? We cannot know exactly what motivated the Saudi rulers on this occasion, but what we do know is that the savagery of these people always stood in stark contrast to the pacifism of the humble Sheikh! Here was a man who believed that the language of truth was more powerful than any number of bullets, and who encouraged his followers to confront violence with the “roar of the word”! Like his spiritual predecessor, Dr Martin Luther King Jr., he fought back against injustice and oppression using only the weapons of non-violence. “Not by violence, but by our determination, by our belief, and by our steadfastness shall your power be defeated”, he said. No wonder they hated him! In truth, I can understand why the government of Saudi Arabia hated this man so much. It was fundamentally, I think, because he refused to give them his true allegiance. “We submit to the authority of God, His Messenger, and his family, and that’s it. We do not submit to the authority of a ruler. Never. No ruler, whoever he may be, has authority over us. Power does not grant a ruler legitimate authority. Sheikh Nimr raises questions here that we all need to consider carefully. What does it mean to owe allegiance to a state or to any particular political system? Why should we love those who are born on the other side of our national borders less than those that are born on our side? At what point does patriotism become idolatry? Interestingly, the early Christians faced exactly this same problem. When the early Christians declared that ‘Jesus is Lord’ they used the word ‘kurios’ (Greek for ‘lord’) that was a title that Caesar wanted to restrict to himself. By declaring that Jesus was Lord they were saying that Caesar was not Lord! Like Sheikh Nimr, they refused to give their ultimate allegiance to the state, and like Sheikh Nimr, many of them were hunted down, abused, tortured and killed! To my understanding, this stand is the natural outcome of our monotheism. If we believe that there is only one God, then there can only be one ultimate authority. Genuine monotheism will thus always relativise the authority of any political leader, and so genuine monotheists will always be thorns in the side to political tyrants. This, I believe, is what Sheikh Nimir leaves to us – a belief in only one God who alone lays claim to our obedience and through whom we are ultimately all sisters and brothers. For just as true monotheism relativises the authority of political leaders, so it reminds us that all sects and divisions between us are only temporary, for we are all the children of the same God. From the one God we have come and to the same God we will return, and so, in the meantime, we are all equally deserving of respect. Sheikh Nimr Baqir al-Nimr – a man of insight and compassion, and a man who was ready to die for his beliefs. And so we who follow the one true God likewise have no other choice. We pray that we might be spared the violence that was visited upon our noble brother, and yet we too are ready to pay whatever price it is that God asks of us to uphold justice, to pursue the way of peace, and to remain faithful to our beliefs unto death.